Today, any politician who uses the word “hope” and “change” – as in, “I am the change you’re looking for” – is unable to waste our time with US perverted elections whatsoever. The whole system is corrupt. Integrating with injustice is no longer an option. Obama was the straw that broke the camel’s back for us. Truly, his tenure has hurt our hearts in so many ways. Not least of which is the fact that a Black man has become number one superpower overseer of the profit-over-people paradigm. Ezili’s HLLN will not be supporting Obama’s reelection. We suggest conscious folks nix the political theater of the Republicans and Democrats, concentrate on local self-reliance, local community building, local people empowerment, local building of relevant educational, health care, local food sovereignty, local production, local work and local communication self-sufficiency infrastructures. Don’t count on any government to “save you”. Not happening folks, not with perverted electoral politics, whether you’re in the US or Haiti. The corporations have bought out the politicians and they’re about servicing Wall Street, giving corporate welfare, maintaining their jobs at ALL cost. Moreover, what has the Supreme Court done for Main Street lately anyhow? Or, to preserve its objectivity, its reputed sacredness? Like the Democratic and Republican members of Congress, the folks at the Supreme Court are a reflection of the times. They have simply become an arm of the global corporatocracy, giving more human rights to corporations than to human beings. Supreme Court appointments are simply not a sufficiently important issue to vote Democrat. The old dog – “vote-for-the-lesser-of-the-two-evils” argument no longer has traction – won’t hunt. People, of all ethnicities, are tired of dealing with evil. Period. If being a “pragmatist” or a “realist” means choosing only amongst evil, count us OUT. The US-Euro pragmatic philosophy has a place, brings lots of comfort, but it is also responsible for the myopic resource wars and prevalent loss of the human soul amongst the schooled peoples worldwide, not to mention the rut and perennial impasse we’re in with perverted US electoral politics. Fact is, the US voting rights our Ancestors fought and died for, are redistricted out of legitimacy at the whim of the more wealthy and more powerful. And that’s LEGAL! I am envisioning another world. Obama betrayed the American voters who expected he would not gut the US Constitution. But he has. And, some of us here at HLLN are lawyers. It’s simply unforgivable on so many levels that Barack Obama went further than George W. Bush in denying human rights and social justice to US and world peoples, like Haitians. 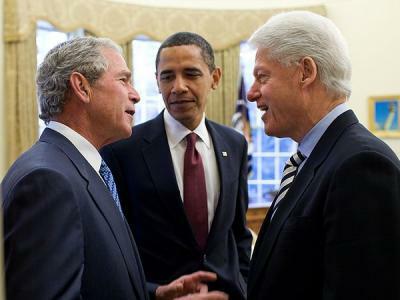 Under the Obama tenure, indefinite military detention of U.S. citizens is lawful in the land of the free and home of the brave and Haitians are saddled with George W. Bush and Bill Clinton to help us become more a democratic and stable Black nation! Susan Rice takes over the role Colin Powell played for the Bushes while Cheryl Mills is out there pushing the Duvalierist agenda in Haiti previously championed by Bill Clinton’s commerce secretary, the late Ron Brown. Yes racism against Obama exist. No doubt. But, Obama ruined his own integrity by betraying the hopeful world who wished respite from empire’s invasions, narcissism, resource wars, denial of social justice and land grabs behind the do-gooder facade. Obama especially betrayed the weary American people who voted for him. Yes, Obama probably will win again over Romney. The powers that be are very satisfied with the pretty Black family mask of US imperialism and Americans, of all ethnicities, are programmed for the fairytale narrative and for suburban amnesia; would rather have comfort to liberty. Obama did not bring American soldiers home but started other wars. Both parties are the same. And, in a world of infinite possibilities we choose not between the lesser of two evil. In fact, those of us who are not into denial and work at the human-rights front lines prefer to face the Republican snake head-on than the confused and gutless Democrat chameleon whining about being a progressive when it is NOT. There’s no difference between the two US political parties, except one is more direct in its tyranny against the most vulnerable amongst us. The other hides behind pseudo liberalism and gives us Clintonesque deregulation, NAFTA unfair trade and loss of US jobs, gutting Glass-Steagal to serve the Goldman Sachs cadres, Welfare-to-Work when all work has flown overseas where US superpower might makes sure there’s no minimum wage, no human rights, unions or respect for Black and Brown life. Whoever is in charge of the profit-over-people paradigm, Democrat or Republican, Ezili’s HLLN will be confronting 24/7. Full time. Frankly we prefer watching the Democrats in the opposition to the Republicans opposing EVERYTHING that they sat by and watch OBAMA preside over. There’s much less emotional tie-in for me there. If that means facing http://www.youtube.com/watch?v=BLWnB9FGmWE, and that is some sort of Armageddon, so be it. Bring it on. But there are other choices, like everyone NOT showing up for this theater and nullifying the elections. Envision that. A courageous electorate that stops believing things must stay as they are with the duopoly. Just imagine it. Share your thoughts with us on this position. All these special interest groups disappointed in Obama’s unfulfilled promises need to get a grip. This is their wake up call for being so naïve as to invest their hopes in a mere mortal. If God couldn’t, or wouldn’t see fit to alleviate the terrible conditions in Haiti, how the hell do they think Obama could do anything?? Yes, a vote for Obama was a vote for change and hope, well you got it. Obama is president instead of Dubya. As for hope, it has been kept alive by not being fulfilled. What more can you ask for? Jeeze. Black folks and their point men Cornel and Tavis are also stewing in their collard green juices because Obama hasn’t thrown them any corn bread crumbs. They’ve overlooked how their savior is being crucified by Republicans for the sin of being black, nailed there on the cross, taking one for the team. If he dies at the polls, Blacks will be forgiven for wanting their grievances addressed. Amen. Yes, Obama did at least toss the gay community a bone, a voting bloc which incidentally has lots of money to fatten his re-election coffers. Notice how god also didn’t intervene on this issue, probably because he doesn’t give a damn about a male gay bride marching down the aisle to marry his groom. Guess he figures they’ll get theirs in the end. Of course, women aren’t bitching too much, because they were perfectly capable of waging their own battle against those chauvinistic Republicans who want to keep them barefooted and pregnant. Michelle has certainly been an inspiration to them, what with her planting a vegetable garden and writing a book about. Awesome! Surprisingly, the Hispanics got a Supreme Court justice out of the deal. Not that it matters because while Blacks were leveraging for position, the Amigos humped up on more babies and have now become the majority. So it’ll just be a matter of time before they take down the gringo conquistadors and replace Cinco de Mayo with a new holiday! Cynique, any rational human being knows that Gawd is republican. Also, you often trip me out, but this just took the cake. People have amnesia like no other, too. I clearly remember how Tavis Smiley was a forreal (Bill) Hillary Clinton supporter. I remember Maya Angelou with her "my girl" commercials about Hillary Clinton. I don't know how long it's going to take people in America to see politicks for what they are, whether the face is white, black, or aything else. As long as the society is one based on profits before people, the politicians, scientists, as well as community "leaders", etc. will reflect that. Two American moments, which one will we extend and sustain? I grew up with the picture on the left. That's the America that lynched Black soldiers in their uniforms after World War II. It's the America I was taught. It's the America unfortunately I've lived through. It's the America that killed the Dreamer. Yes, I grew up with the picture on the left. I know that America. But yesterday, on November 4, 2008, I was most happy to actually meet the America that chose to make the picture on the right its new dawn.... Honestly, as someone raised in post-Civil Rights America, I don't know this America. I didn't think it was possible. I am most happy to meet this America and I am most thankful for President-elect Barack Obama's unyielding audacity of hope. Most happy to have taken part in it because he envisioned what could be. I am glad to meet this America of new possibilities, this America of November 4, 2008. I want to be part of this America where I don't feel an outsider to Officialdom because I work for human rights, social justice and equality, workers rights, reciprocal trade, respect for Haitian democracy and constitutional rule. I hope that that America won't again turn away from this hope for the poor and disenfranchised all over this planet, and go back to promoting the special interests of the corporate elites, valuing profit over people. Senator Barack Obama's victory has introduced me to the possibility of that America. That's a stunning feat. I hope all of us rise up to meet this America we all took a glimpse of on November 4th. Change would truly have come if we actually ACT to extend the November 4th values and broad, inter-generational coalition, across the races, transcending political party, class and creeds that was forged to elect Barack Obama. And extend it each and everyday of our lives. I didn't believe it existed or could be pulled forth in my lifetime. That I've lived to see it, to know it's there and not just the ephemeral dream; that I have lived to see a Black man, this man of integrity and enormous vision and competence, this son of an African, with an aunt who is still an "illegal alien" about to call home, a White House built by the forced labor of African captives, that this America exists and was pulled forth for the world to see, makes me more thankful than I can say. I pour libation for all the Ancestors who did not live to see that the color line has been crossed. I weep for all the American lives and Iraqi lives in Iraq and elsewhere around the world that paid the ultimate price for this day to come so simply. I pray the children in the Congo will benefit from this new day. I hope this means Haitian lives will also be more valued and a new US-Haiti partnership is on the horizon. I pray that a new dawn of American leadership is at hand and hope that President Barack Obama will work with us as we've outlined in "What Haitian Americans are Asking of the New US President." Four years ago, part of HLLN mission, as articulated in Campaign Six was to help to elect a President that would not extend the tyranny and disenfranchisement of the Black masses that Bush Regime change brought to Haiti in February 2004. We hope to retire that campaign now and have a working relationship with this new Congress and this new President. Yes we can - Wi nou kapab. Yes, we did it! OBAMA 08’!!! Nothing that I know or have lived, especially after Bush's bloody regime change in Haiti on February 29, 2004, prepared me for the momentous election of a tolerant, compassionate, (seemingly people-over-profit) Black man - who stands for a more equitable world - to the presidency of the United States. I don’t know the November 4, 2008 America…But I'd like to make it real and have a relationship with it. Flaunt their love of justice and liberty and then support Taliban-type regimes and when that goes awry, bomb the heck out of Afghanistan. Sponsor elections throughout “the developing” world, and then outfit their own private armies, to “restore order” and reverse said elections whenever the US-sponsored candidate fails to be elected by the populist. Mobutu, Duvalier, the Gerald Latortue Boca Raton Regime, who maintained these? Sent in US Special forces, with the assistance of French and Canadian soldiers, to kidnap the Constitutionally elected President of Haiti and exiled him to the Central African Republic in order to dominate Haiti, secure the Haitian market for US goods and take by US-sponsored force, once again, Haitian resources – state-owned companies, Haiti’s gold, oil, gas reserves, coltan, et al... and all they couldn't persuade Haitian President Aristide or the Haitian people, to give away. Was built on the genocide of the Amerindians, the enslavement of Africans, and then the blood of centuries of lynching with impunity, the razing to the very ground of Black cities like Rosewood and the “Black Wall Street” in Oklahoma, the colonization of Haiti for 19 years as well as the neocolonization of Dominican Republic, Latin America…; built on gunboat diplomacy and US marines bringing (their sort of) “order” to “backwards” Black and Brown countries all over the world. Incarcerated and indefinitely detained Black children, women and men, whose only crime is that they are poor and from Haiti, at Guantanamo Bay, before they started using it as a place to indefinitely incarcerate and torture Al Qaeda, and other "enemy combatants". Has an overwhelming, disproportionately high African American male population (more than 50% of total US prisoners) in jail when we only make up 13% of the population. More than half of death row prisoners in the US are Black males. That's the America I know. That's the America I thought would never make a righteous Black man with the democratic and social justice values of Barack Obama its President. That's the America I know. Is the nightmare is over? President Barack Obama was born of an African father, a white mother from America, spent his childhood in Asia - America/Africa/Asia - will this internationalist bring US change that will help bring relief to the disenfranchised of the world - to the children in Haiti, Baghdad, Congo, Beirut, Gaza, and all the other places in the crosshairs of the American empire's superpower guns? There is work to be done, and it's up to all of us, not just President Barack Obama. In his victory speech, President-elect Barack Obama, had the vision to place the responsibility for the welfare of the nation in our own hands, us the citizens, where, in a democracy, it truly must rest. We know the odds, but Obama’s victory has taught us not to be led by fear or doubt but faith and hope. He’s taught us that anything is possible. Yes we can - Wi nou kapab.